We Won’t Hold Back – Our Response Will Be…. On Tuesday, sniper fire from Gaza slightly wounded an IDF soldier along the Gaza border. In response the IDF attacked a Hamas military camp. Israel’s IDF is the only army in the world confronting Iran’s military. The photo here is a Facebook post from the IDF. 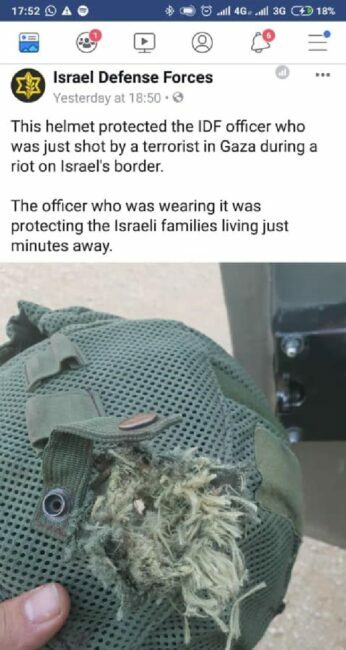 It is the helmet the IDF officer was wearing when he was shot at – the helmet that saved his life. AFSI donated these same types of helmets on its last trip to security personnel. It hits very close to home when we read this and is a demonstration that the work AFSI does keeps Israel safe.